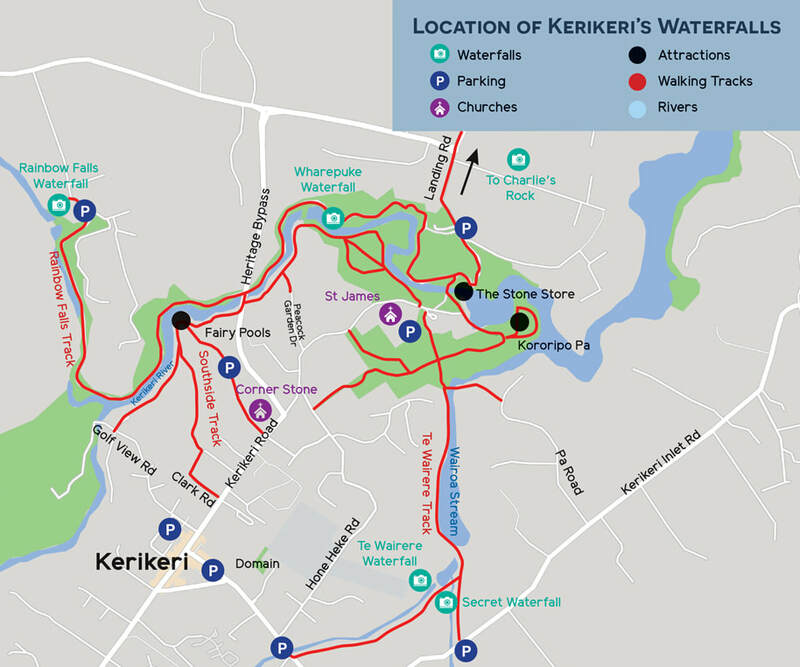 Kerikeri has a network of tracks within the town, featuring five stunning waterfalls. Together they make up a really good weekend's walking with time enough for other attractions. ​Bay of Islands Walkways Trust. Tracks are easy to reach from the town centre, motels and car parks. ​​Click Google track button for interactive online Google map. There are five separate tracks plus the main Kerikeri Road. The black line indicates the Te Araroa track, the blue line is the Wairoa and Southside track as a single, circular rout and the red lines are feeder tracks. The main starting points are either at the town centre (where most motels are) or at the Stone Store Basin where there are several car parks. 3. Charlie's Rock waterfall off Landing Road. 2.3 km from the Stone Store. ​4. The Southside track runs through the Booths Wharapuke Reserve historic track which is a lovely wooded trail. 2.2km.long. Entrance 50m below 192 Kerikeri Road. 5. Southside of the Kerikeri River from Golf View Road along the river and up through Peacock Gardens. 1.5 km. Kerikeri"s subtropical climate has proven ideal for growing oranges, kiwifruit, avocados, tamarillos. macadamia nuts and a wide variety of fresh vegetables. These can be bought from the town's two weekend markets, at the Packhouse on Saturdays and at the Farmers Market on Sundays. ​There are also several vineyards in the area. 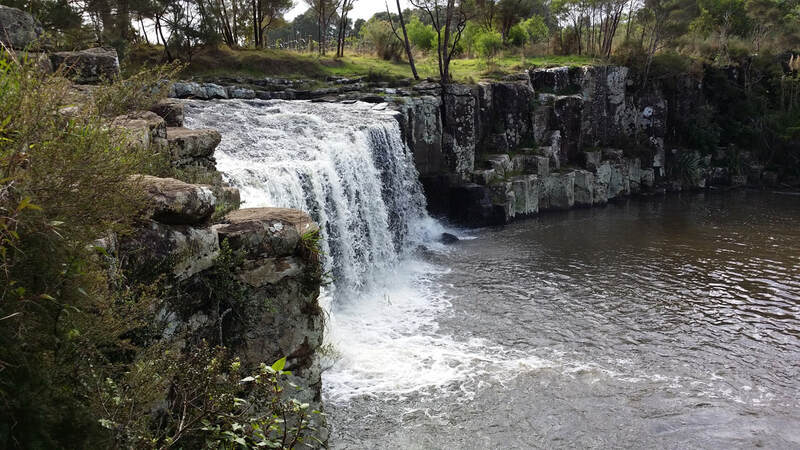 Kerikeri has a good range of eating places and accommodation establishments, to suit all price ranges. They will be happy to help make your weekend a special event. 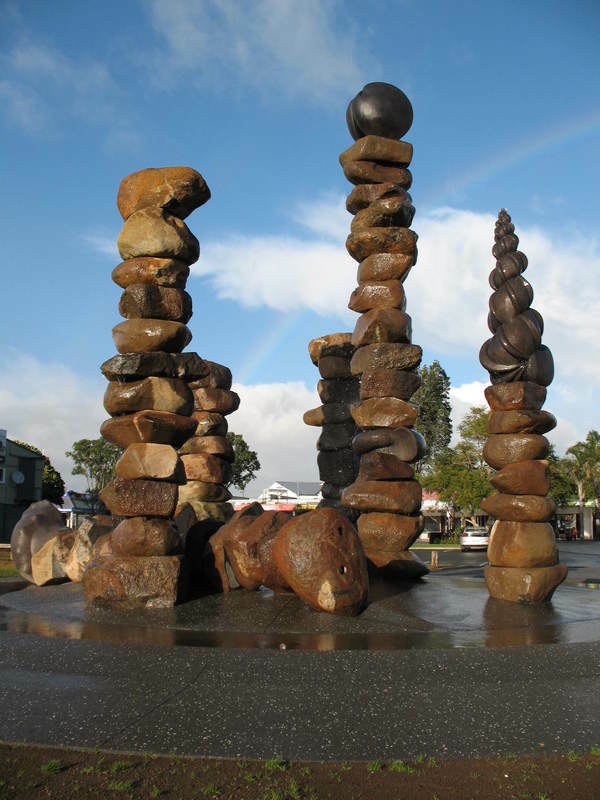 ​The Chris Booth sculpture on the Kerikeri Domain. Charlie's Rock waterfall. Not the biggest but probably the prettiest.